At Fall Crown Tourney, Konstantia was made a baron of TRM Damien and Issabell's court. 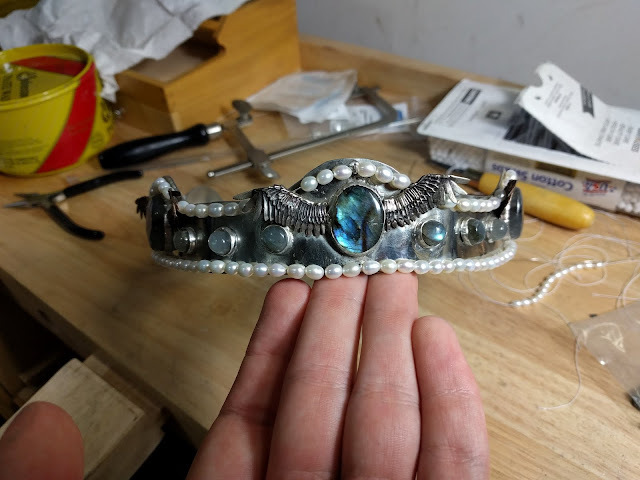 I had the pleasure of making her coronet. I also managed to not spend the last three months with my fingers steepled while cackling maniacally. There was a moment of worry at the start of this because I said I would be interested in doing a coronet before I knew who it was for. When I heard it was for Konstantia, I knew that meant Byzantine. Which means bling. Lots of bling. 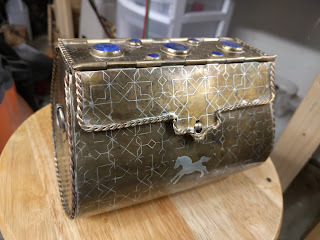 I had actually made a comment to Jakob before about Byzantine style looking like a pain to make because of the amount of bling. But, it was a good challenge. Stones were more important than the gold. The Byzantine empire was full of gold mines, while precious stones were imported. So, the focus was on the stonework while the metal itself was mostly unadorned. Pearl borders are cruise control for Byzantine. To personalize it, Konstantia's device is azure, a standing seraph argent, a bordure gyronny argent and sable. 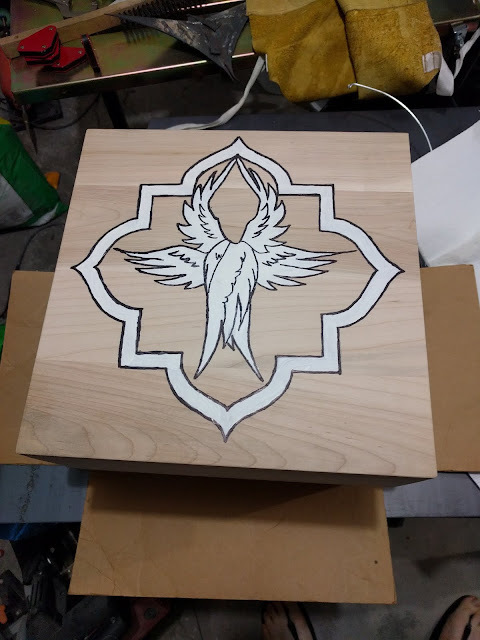 I had the thought to style the mountings after a seraph's wings using the description from Isaiah 6:2: "Above him were seraphim, each with six wings: With two wings they covered their faces, with two they covered their feet, and with two they were flying." So, two wings extended upward and turned in, covering and holding the top of the stone; two covering the base, and two extended. This had the bonus of being able to nestle a pearl in the two wings extended upwards. My original plan for the wings was to engrave the patterns because I was wanting to pick up engraving. That lead to... not good things. So, I decided to stick with what I knew for now, meaning casting. For the stone work, I seemed to remember Konstantia liking labradorite. 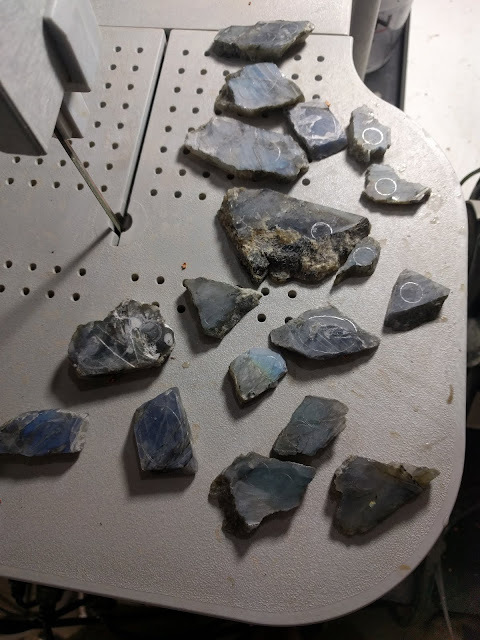 Conveniently, I had a pile of labradorite rough sitting in my garage waiting to be cut. So, I could pretty much go as crazy as I liked with cabs without worrying about blowing up my budget. After some discussion of this design, it was pointed out that the layout of the wings could be mistaken for strawberry leaves from a distance, which is a reserved charge. 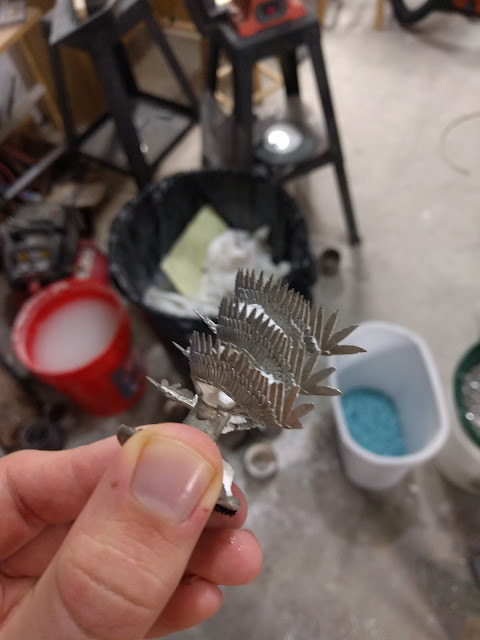 After quickly searching for how strawberry leaves are rendered in metal, I agreed and was rather glad I didn't try to make the design a surprise. 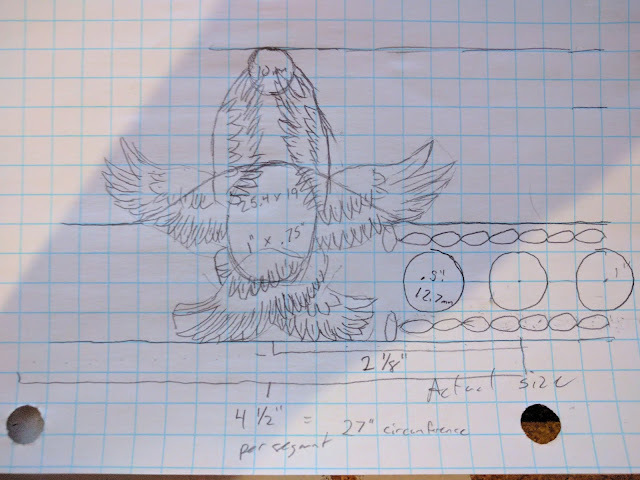 Ayisha joked that Konstantia needs to figure out how to reign twice so she can have the original design. I was concerned since that meant I was also losing my method of mounting the pearl, which I thought was a key element in a court baronage coronet. But, apparently "spheroid" can include oval cabochons, so the six keystone cabs took care of that. 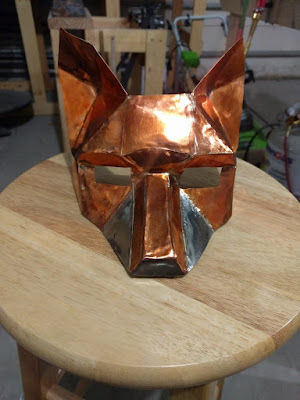 Going out of order here, but after taking care of some casting and lapidary work, this was my final design mockup. I was pretty happy at this point. I had a pile of labradorite sitting around my garage, since I think it's a cool stone. The design called for six 18mm x 25mm oval cabochons and eighteen 10mm round cabs. 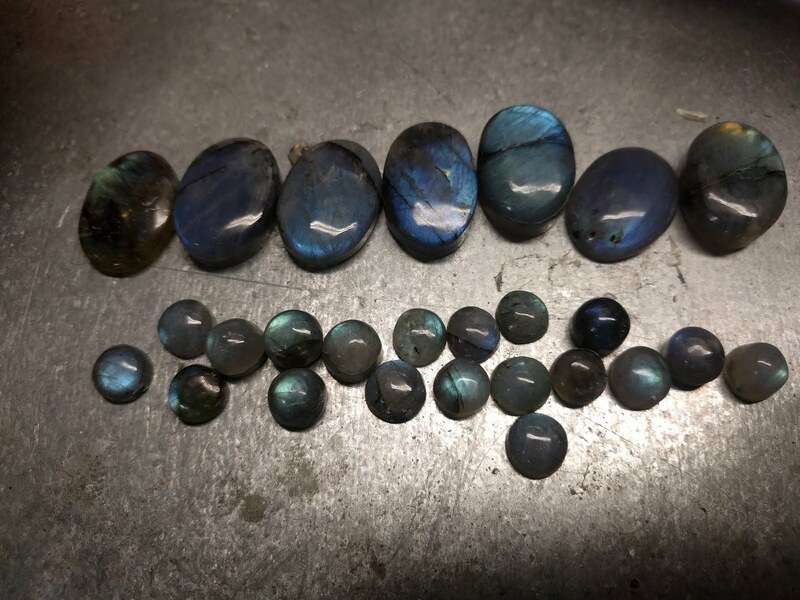 The tricky part about cutting labradorite is aligning the "flash" of the stone. Labradorite is really, really pretty... at one angle. Every other angle it's a grey stone full of tiny cracks. 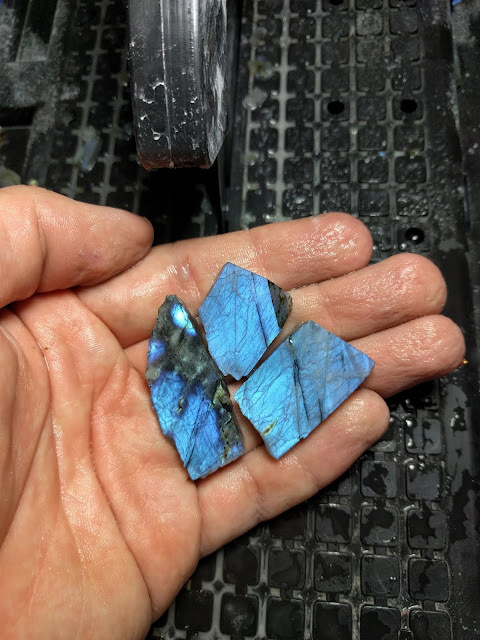 Slabbed labradorite, with cabs stenciled on. The cabs got cut a little taller than they needed to overall, partly to make sure I didn't lose one of the flash faces I was cutting around and partly to try to make them a little more durable. 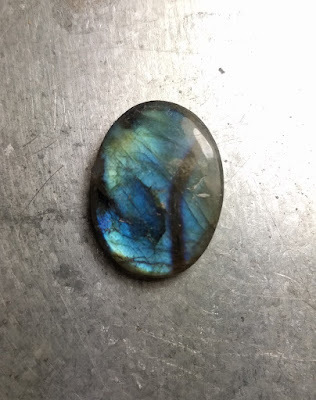 Labradorite tends to fracture pretty easily. The height did cause some issues later on, so striking a balance between those concerns and having a stone that can still be set easily is something that can be improved on. The cabs all came out nicely though. Since there were no spoilers in that picture, it got tossed on Facebook. Konstantia liked it. I cackled. I did have one particularly cool cab I went ahead and set aside to be the focal point for the coronet. I was able to bring my fancy tech into the picture for this. I designed the wing and 3d printed the models for casting. 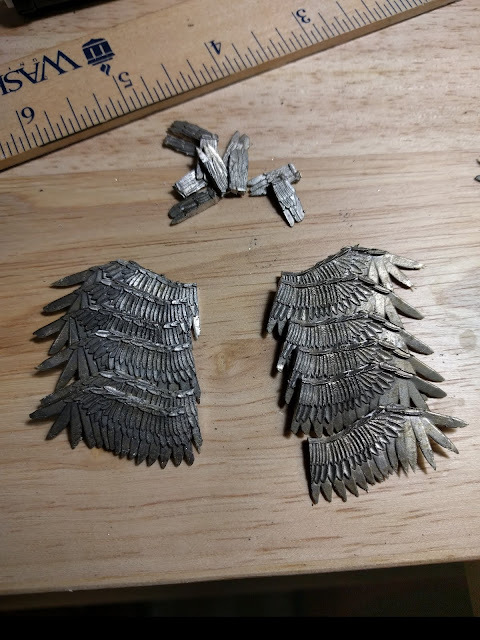 This was done in two runs; I had to go back and cast a few extras due to a few wing tips melting during soldering or getting caught and breaking during polishing. 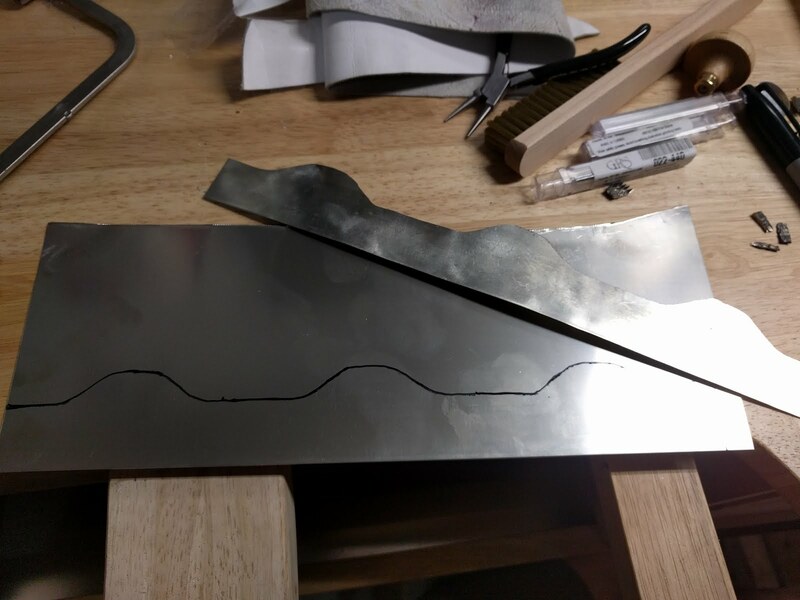 The cast wings were slightly longer than I needed for the final mounts, so I trimmed the inside slightly to fit. Not too much to say here. 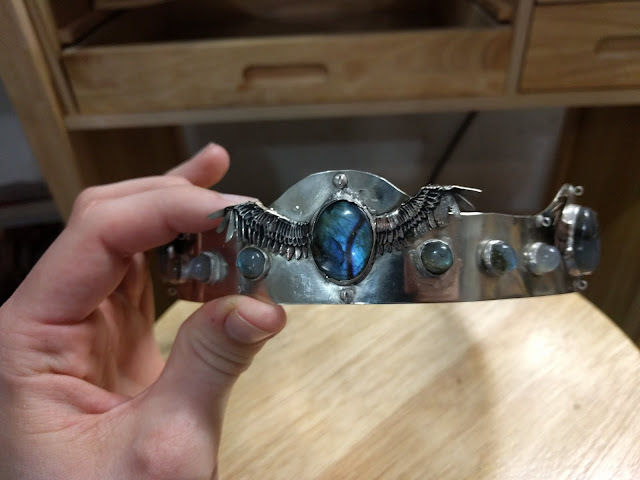 I wound up using 20 gauge nickel silver for the coronet base. This was probably the longest step of the process. I had bought fabricated bezel cups to try to speed things up, but in retrospect, I will probably just make my own settings in the future. The cups have a slight dome on the base, so unless you really pack in the solder, it looks like there's a gap around the base instead of a nice smooth finish. Also, since I'm hand cutting my cabs, they don't perfectly conform to the standard cups and a few settings had gaps. 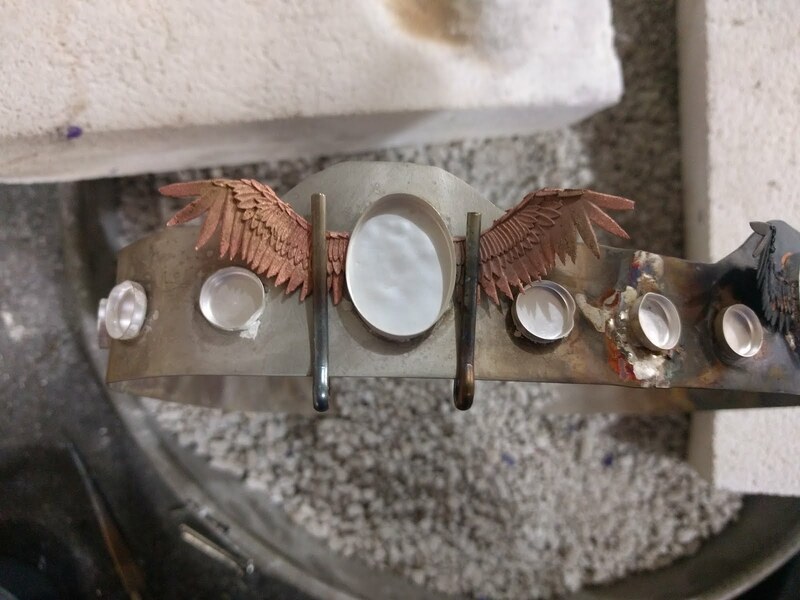 After the bezel cups were on, I went back around and soldered on the wings. Also in retrospect, I probably could have used my tweezers instead of cotter pins to hold the wings in place. The cotter pins were a bit too much of a heat sink on the top side and made getting a good solder flow difficult. If I had more time, I probably would have just ordered some titanium strips from Rio to make my own clips. 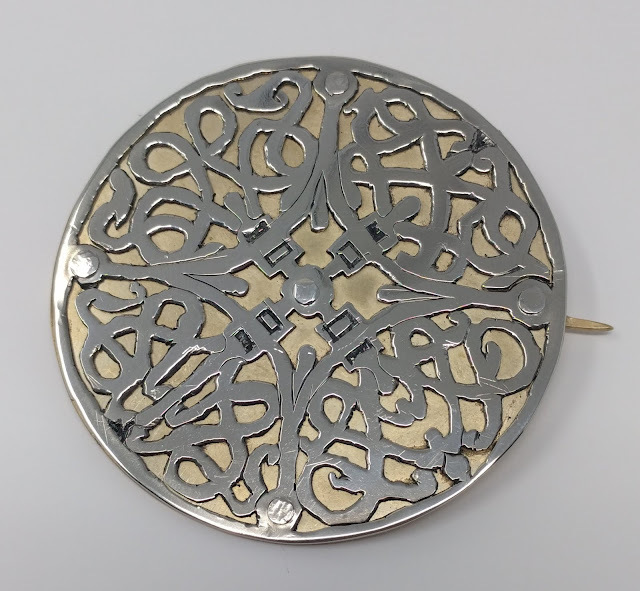 Not included in these pictures, but 30 small little pearl eye posts were also soldered on as supports for the pearl strand later. 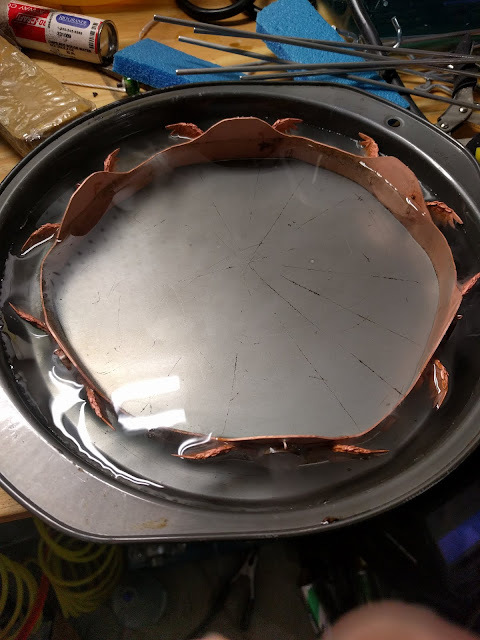 Now, unfortunately, it seems that putting white bronze from Rio in pickle has the same issue that putting steel in pickle does: it knocks all the copper out of solution. Up to this point, the nickel and silver were staying nice and white. But the moment the wings went into the pickle, everything got copper plated. Not a huge deal, but a pain to clean up. The copper can be eaten off with "super pickle": hydrogen peroxide with anywhere from a splash to a 50-50 mix of acid. Usually normal pickle, but I've also used vinegar and heard of citric acid being used. After this point, the wings got a black patina painted on for highlights, then a lot of polishing and stone setting happened. Stone setting honestly wasn't the best; I haven't set too many cabs up to this point and the cabs I made were a little tall for some of the settings. I also ran into some issues where solder from the wings had creeped up the bezel wire and made the large cabs harder to set properly since the setting was thicker. Last steps were stringing all the pearls and adding the interior padding. It wasn't part of the original project, but I recruited Jakob to make a wooden case for storage. I had him leave it unfinished so I could paint Konstantia's badge on the top without giving away secrets that weren't mine. The inside got blue egg crate form for protection. A beautiful Coronet for an excellent lady! Thank you, Finan. I am touched by the research you did and the piece itself. Thank you so much. This is fantastic work, and it is SOOOO Konstantia!